National Suicide Prevention Lifeline | What happens now? The National Suicide Prevention Lifeline has launched a website for attempt survivors, which ought to inspire other organizations to do the same. Eventually, the site will be confident enough to share the full names of people whose stories are shared, but it’s a start. It also has a section on the history of how attempt survivors have come out of the shadows, but its timeline is missing key game-changing developments like the Live Through This portrait project. And the National Council for Behavioral Health has begun a series of activities around people who’ve been suicidal, starting with a new webinar on the national Way Forward report that came out this summer. The National Council’s leader on suicide prevention work, Cheryl Sharp, speaks openly about her own experience with suicidal thinking and has been a role model. Finally, a new training program called Suicide to Hope is expected to launch next year. It’s a project of LivingWorks, and a number of people who’ve been suicidal have been involved in field trials. The first trainees will be care providers, though families of suicidal people might join trainings in the future. A focus on working with people to set recovery goals is central to the one-day program. And it will speak for itself. Here’s the story behind it. Edits continue, and don’t be deterred by the introductory note of caution. The idea behind this project is that we can talk about this openly and with confidence. And that’s exactly what you’ll see here. This video is being explored as a training and messaging tool at the national level. Interested? Contact us. 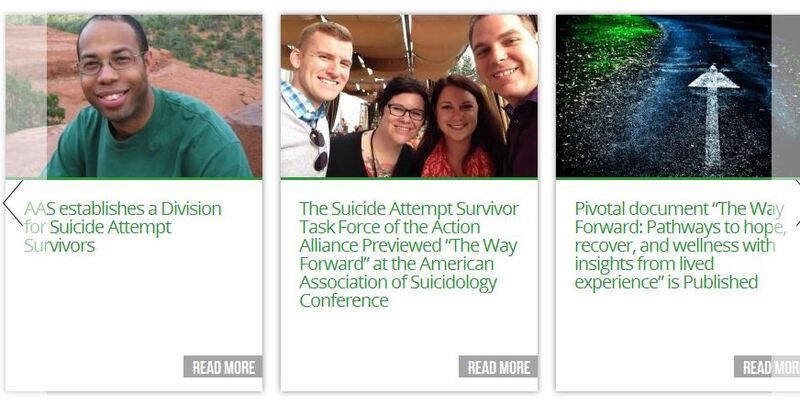 Before moving on to this week’s guest post, here’s some good news: The Huffington Post has published our blog post from last week on its site as part of a special feature on suicide attempt survivors. Separately, also worth a look are these video interviews with three pioneering attempt survivors who talked openly about their experience back in the day, not long ago, when no one dared to mention it.